BELLIN - Plan de la Ville de Boston et ses Environs. BELLIN, J.N. - Plan de la Ville de Boston et ses Environs. Plan de la Ville de Boston et ses Environs. - BELLIN, J.N. 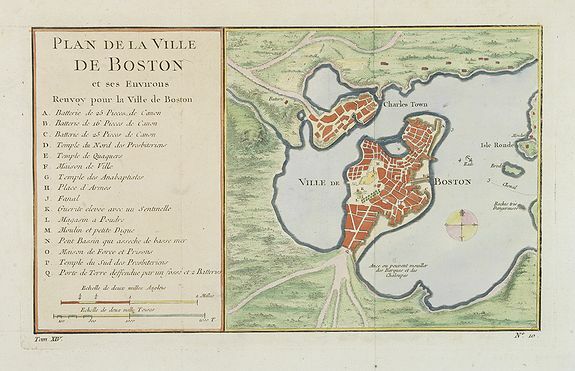 Title : Plan de la Ville de Boston et ses Environs.. Size : 6.5 x 10.7 inches. / 16.5 x 27.1 cm. Description :One of the earliest obtainable town town-plan of Boston and Charlestown, with an extensive index of 16 specific sites at left, each located on the map. Shows Boston 13 years prior to the American Revolution and at a very early stage in it's evolution. In smaller format, he issued the Petit Atlas Maritime (1764), which contained 580 charts, as well as maps to illustrate l Abbé Prevost's Histoire Générale des Voyages (1746-1757). Bellin also produced a substantial number of important separately issued maps, particularly reflecting continuing discoveries and political events in the Americas. Condition : Two horizontal folds as issued. Paper slightly age-toned. In good condition.